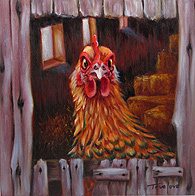 Editor's Note: An exhibit of work by Robin Truelove Stronk is currently showing at the 1868 Crosby House B&B (175 Western Ave., Brattleboro, 802-257-7145). Barnyard animals are in the dining room, some painted on vintage feed bags. The parlor's "Where the Wild Things Are" theme includes owls, hawks, and a mountain lion—two of these were painted on shed moose antlers. Robin will be on hand during Gallery Walk on June 3 to meet visitors and sign copies of her recently published memoir Vet Noir (see below). Tours of the Italianate Victorian house and grounds are also available during the Walk and by appointment. 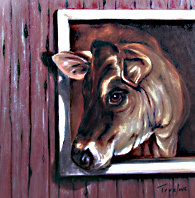 Robin Truelove Stronk is a 1975 graduate of the New York State College of Veterinary Medicine at Cornell University in Ithaca. 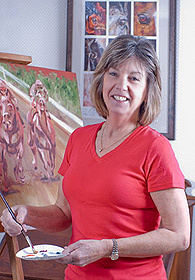 Her practice career has run the full gamut from large to mixed to small animal settings. During this time, she has always had a deep need to study and produce artwork. Studies at River Gallery School in Brattleboro help refine her interests and style. Not surprisingly, her subjects are almost exclusively the animals that have been her life's work. 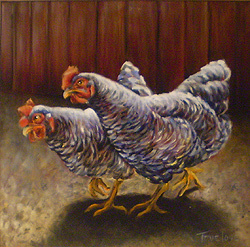 Robin has had the honor of having her paintings ("Feather" 3/15/97 and "The Dispute" 2/15/00) featured as cover art for the Journal of the American Veterinary Medical Association. "Eyes on the Future," a commission for the Veterinary Scholarship Trust of New England, was her third cover on October 1, 2008. In addition, she received Judges Awards at the International Exhibition on Animals in Art at the Louisiana State Veterinary College in 2003 and 2006 for "Dakota" and "Lay or Bust." 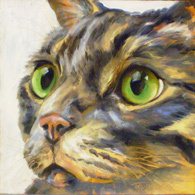 Working primarily in oils, she seeks to portray the animals on an intimate level, to make a connection with the viewer so that they feel this image could be of their personal pet. By placing herself at eye level or even lower than the subject, the image is that seen by another of its species. 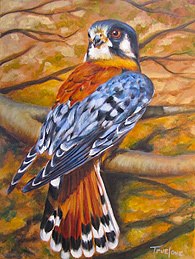 Having personal experience with the subject allows Robin to capture its essence. In this way she allows each individual's playfulness, loyalty, intenseness, and other traits to come through. Her veterinary training is invaluable to help fill in the details when working from photographic material. Her goal is to portray the story told in their eyes. Robin's artwork is also seen in Costa Rica with gallery representation in Jaco. There she paints tropical subjects with a more flamboyant palette. Sea turtles, fish, and fruit trees are often her focus while painting in that very different environment. 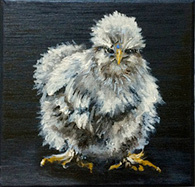 Retired from full-time practice, Robin now fills her time with art, writing, and enjoying her animals. She lives in Southern New Hampshire with her husband where they have raised their three children. Robin's latest endeavor is the publication of a book of her memoirs, Vet Noir: It's Not the Pets - It's the People Who Make Me Crazy. In her book she provides a light-hearted glimpse into the world of veterinary medicine where animals are unconditionally loved and the people are kind beyond measure, dedicated, and splendidly appreciative—mostly when they are not being quirky, infuriating, and more often than not, unknowingly comical. In her book she enters the new (to her) world of cartooning by providing illustrations to her stories.